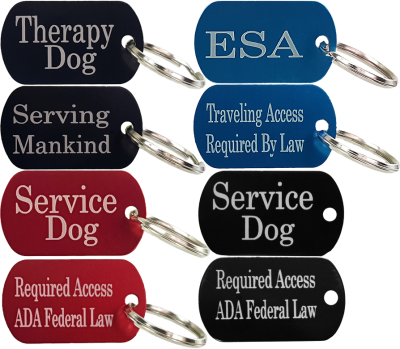 This is a high quality engraved aluminum dog tag for people with a service dog, therapy dog, or emotional support animal. Both sides of this anodized aluminum tag have been laser engraved with different wording, depending on the style of tag. This aluminum dog tag is 1” x 1.5” in size and is available in black, blue, or red. The tag comes with split ring and is a perfect size tag for smaller working service dogs. It can also be worn on a bracelet or lanyard. Service Dog: The front of the tag is engraved with Service Dog. The back of the tag is engraved with Required Access ADA Federal Law. Therapy Dog: The front of the tag is engraved with Therapy Dog. The back of the tag is engraved with Serving Mankind. ESA: The front of the tag is engraved with ESA. The back of the tag is engraved with Traveling Access Required By Law.